TS Archives preserved docus dating back to the Bahmani, Adil Shah, Qutb Shah and Asaf Jah kingdoms. Letter by Alluri Seetharama Raju to Bastin, Dy Tahsildar, Gooden Taluq, Krishna Devi Peta. Hyderabad: Muhammad Adil Shah (1626-1656 AD), the ruler of Bijapur in Karnataka, used to mark his firmans with his right hand impression, besides his official seal. A firman dated 1643 AD addressed to one Shah Asadullah Hussaini states that he is settling the dispute in his favour as the rightful heir to Hazrat Khwaja Banda Nawaz. 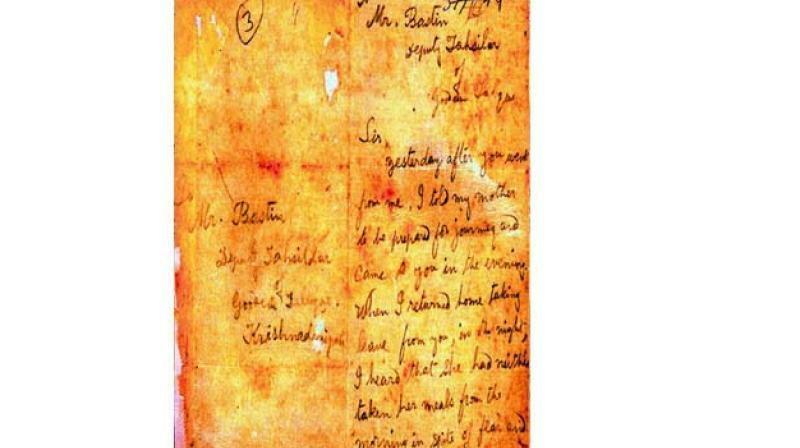 These are but two of the firmans, letters and historical documents that are preserved by the Telangana State Archives and Research Institute, Hyderabad. The documents with the archives date back to the Bahmani, Adil Shah, Qutb Shah and Asaf Jah kingdoms. It also has papers written by Alluri Sitarama Raju and Mahatma Gandhi among other prominent personalities. Shivaji Rao Holkar, the Raja of Indore, sent a letter to the Nizam VI, Mir Mahbub Ali Khan, on January 24, 1891, in flowery English, requesting him to accept a bag of sugar-coated til (sesame seeds) as a token of friendship. Adil Shah took up construction of the Gol Gumbaz, the world’s biggest single-chamber dome structure, in Bijapur, now Vijayapuri, but passed away before he could complete it. He wanted to build a mausoleum on a scale grander than the Ibrahim Rauza, the tomb of his father Ibrahim Adil Shah, for himself, according to papers from the archives. Buried along with the sultan are his two wives, Taj Jahan Begum and Aroos Bibi, his mistress Rambha, his daughter and his grandson. Shivaji Rao Holkar, the Raja of Indore, sent a letter to the Nizam VI, Mir Mahbub Ali Khan, on January 24, 1891, in flowery English, requesting him to accept a bag of sugar-coated til (sesame seeds) as a token of friendship. He requested the Nizam to taste the contents on the occasion of Makar Sankranti. 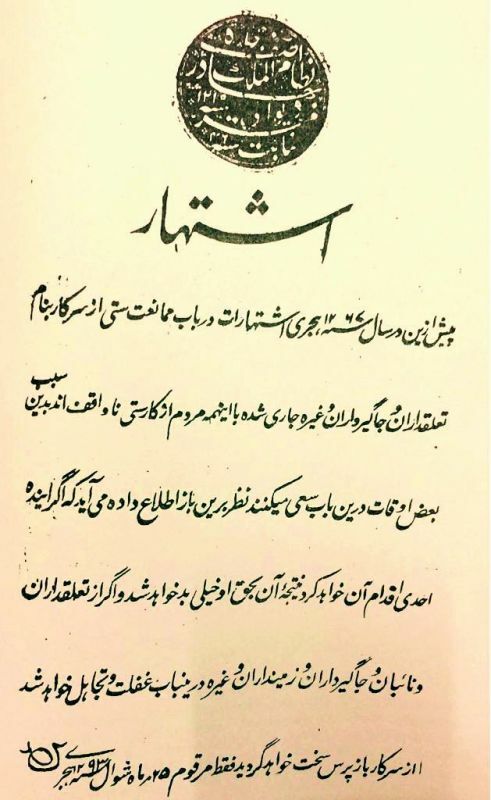 Proclamation on the abolition of Sati issued by the Nizam VI, Mir Mahbub Ali Khan. Mahatma Gandhi’s letters, in his own handwriting, are crisp and to the point. 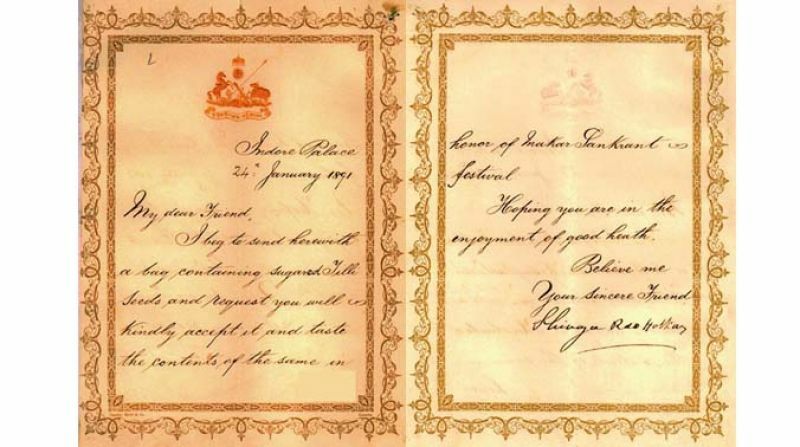 There are several letters between Gandhi and Nizam VII, Mir Osman Ali Khan, besides others during the pre- and post- independence periods with the archives. While some of them are in good shape, others need immediate attention if they have to be preserves for posterity. “We have a treasure trove of documents and they are well preserved,” Dr Zareena Praveen, director of the department, told this newspaper. The oldest document with the archives department, and one of the oldest in the country, is a firman of Feroz Shah Bahmani dated May 14, 1406, granting land as inam to Maulana Mohd Qazi, according to Mr Khaleel, who takes care of the Urdu section. Another interesting proclamation is on the abolition of Sati, the practice where women jump into the burning pyre of their husbands, issued by the Nizam VI, Mir Mahbub Ali Pasha. The Nizam took serious note of Sati being continued in some parts of his kingdom despite the ban. Reminding the people that his government had issued a proclamation earlier in the name of talukdars, jagirdars, and other officials regarding the prohibition of sati, the Nizam says people are unaware of these proclamations and try to commit Sati due to ignorance, according to the papers with the archives. “It is now notified that if anybody takes any action in this direction in the future, they will have to face serious consequences. If Taluqdars, Naibs, Jagirdars, Zamidars and others are found careless and negligent in the matter, serious action will be taken against them by the government,” the proclamation dated November 12, 1876, warns. “We have a huge collection of firmans dating back to the Bahmani, Adil Shah and Qutb Shah kingdoms. There are over one lakh firmans of paper sizes ranging from the present A3 to 3 feet. They are written in indelible ink. Some are in excellent condition. We also have a huge collection of documents from the Shah Jahan and Aurangzeb era,” said Mr Mohd Raqeeb, assistant director, Telangana State Archives and Research Institute. He added, “Some of the rare documents, firmans, letters and other invaluable material that were gifted to the archives came from 23 private and family collections before 1947. They include the Banda Nawaz collection, the Gulbarga and Inayat Jah collections. The state archives began with Mughal records which were formerly in the Mughal Central Governor’s Archives (Qila-i-Arak), Aurangabad Fort in Aurangabad, Maharashtra. Mughal daftars were set up by Aurangzeb in Aurangabad, one of which was in the Qila-I-Ark in 1695. The present archives were established in 1893-94 and slowly grew in size over the years and were shifted from Kurnool to Hyderabad. They are now slated for division due to bifurcation.